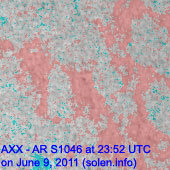 Last major update issued on June 10, 2011 at 04:05 UTC. 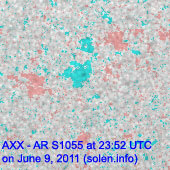 The geomagnetic field was quiet to unsettled on June 9. 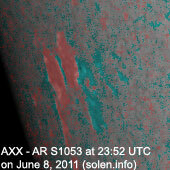 Solar wind speed ranged between 336 and 550 km/s. 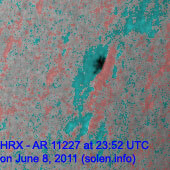 A disturbance arrived at SOHO near 21h UTC with solar wind speed increasing from below 400 to near 550 km/s. The source of this disturbance is uncertain. 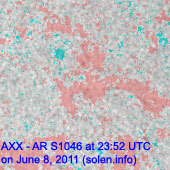 Solar flux measured at 20h UTC on 2.8 GHz was 87.5 (decreasing 4.0 over the last solar rotation). The planetary A index was 11 (STAR Ap - based on the mean of three hour interval ap indices: 11.0). 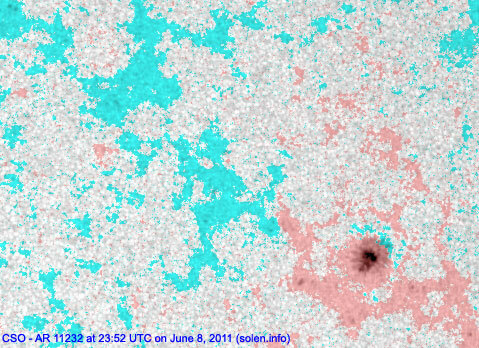 Three hour interval K indices: 33222233 (planetary), 23322234 (Boulder). 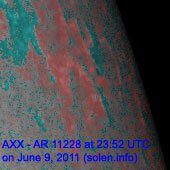 Region 11227 was quiet and stable and will rotate out of view at the southwest limb today. 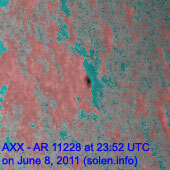 Region 11228 was quiet and will rotate over the northwest limb today. Region 11232 decayed slowly and quietly. 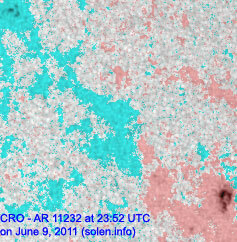 Region 11226 produced 2 flares while at the southwest limb: C1.8 at 03:21 and C4.1 at 03:45 UTC. 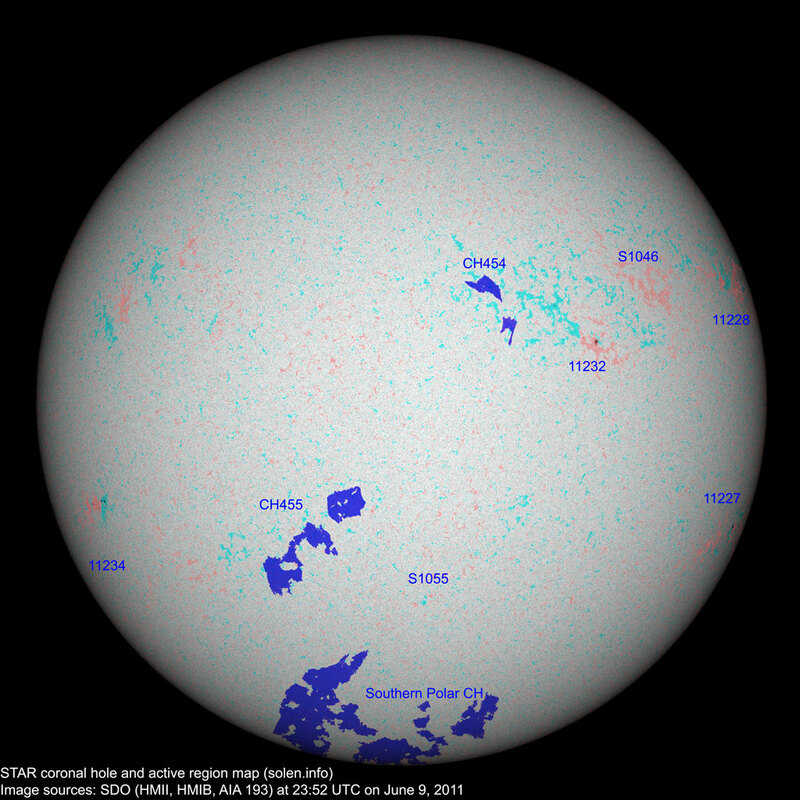 June 8-9: No obviously earth directed CMEs were observed. 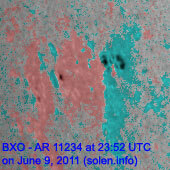 June 7: A wide, full halo CME was observed after the M2.5 event in region 11226. 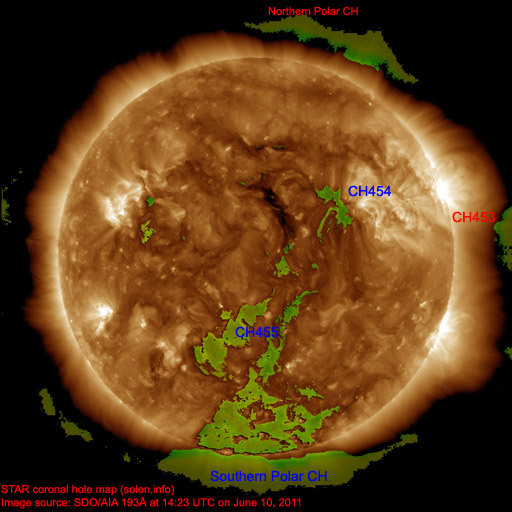 A small coronal hole (CH454) in the northern hemisphere was in an Earth facing position early on June 9. 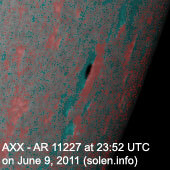 An elongated coronal hole (CH455) in the southern hemisphere will likely become Earth facing on June 10-11. The geomagnetic field is expected to be quiet to minor storm on June 10 due to CME effects and quiet to unsettled on June 11. On June 12 there's a chance of a few unsettled intervals due to effects from CH454. 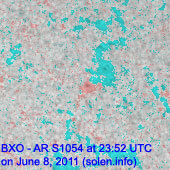 On June 13-14 a high speed stream from CH455 could cause some unsettled and active intervals.